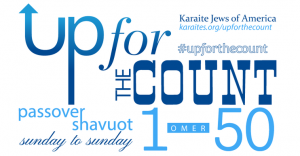 The Karaite Jews of America is in the midst of its Up For The Count campaign, and the KJA has received tremendous interest from non-Karaites who want to learn to count the omer in accordance with the traditional Karaite timing and formulation. This was rather surprising to me initially; but it should not be. Of all the historical divisions between the Karaites and Rabbanites, the one that seems to resonate most with non-Karaites is the timing of Shavuot (which is dependent on when one starts counting the omer). As background, we are commanded to count 50 days beginning on the “morrow after the Sabbath.” (Leviticus 23:15.) Karaites (and Boethusians before us) interpret the “Sabbath” to mean, well, the “Sabbath,” i.e., the weekly Shabbat. 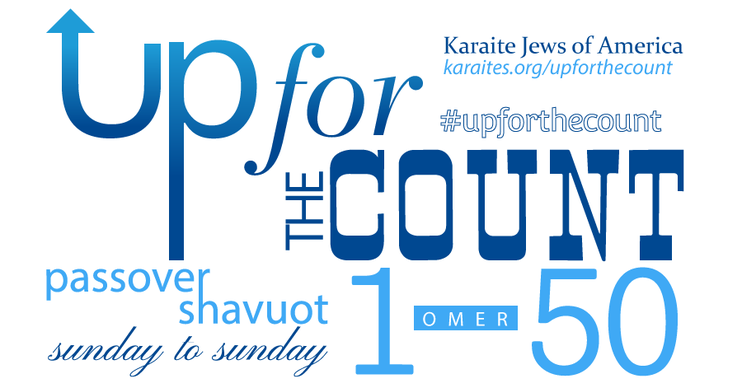 So, Karaites start counting the omer on a Sunday (i.e. the morning after the Sabbath). And Karaites observe Shavuot 50 days later on a Sunday. Always. Those who follow the Rabbinic tradition, here interpret “Sabbath” to refer to the first day of the Feast of Unleavened Bread (i.e., “Passover”). So, Rabbanites start counting the omer on the second night of Passover. And for Rabbanites, Shavuot falls 50 days from the second night of Passover. Always. But after a major Karaite influx into Byzantium in the 11th century, “it seems that the [Karaites’] stress on having the [Shavuot] holiday fall exclusively on a Sunday was bearing fruit.”  So powerful was the Karaite influence on this matter that Rabbanites wrote several polemics against the growing trend. So, the issue today is not so much whether Jews are going Karaite (in one respect) by celebrating Shavuot on a Sunday. It’s that more and more Jews are aware of the Scriptural basis for the Karaite practice, and the Karaite Jews of America (and other Karaite movements) are providing these Jews with a resource (such as Up For the Count) to turn that philosophical awareness into practice. Today is the 5th day of the 2nd week of seven weeks. Today is the 12th day of the counting of 50 days from the waving of the Omer on the morrow after the Sabbath. Ankori, Zvi, Karaites in Byzantium, p. 276. Id. at 276, n. 70, explaining that the following non-Rabbinical religious leaders recognized that Shavuot should be on a Sunday: Anan ben David (founder of the Ananites); Benjamin al-Nahawandi (founder of the Benjaminites); Ismail al-Ukbari (founder of a 9th century messianic Jewish movement in Babylon); Musa of Tiflis (founder of a 9th century Jewish movement in Babylon); and Malik al Ramli (founder of a 9th century Jewish movement in the Land of Israel). Many of these movements were absorbed into the unified Karaite movement. Although the Jewish Encyclopedia states that Musa of Tiflis was a former Karaite, this is not necessarily the case. Karaites of Byzantium states plainly that he was a non-Karaite. (p. 128). Years ago, when I was still a Rabbinic Orthodox, I heard someone giving a talk in a Synagogue in Israel. He argued that the reason we need the Oral Law is because without it, we might read the Torah the Karaite way, and count the Omer and hence observe Shavuout that way too! I saw the absurdity of the circular argument and what a fallacy it was. This was one of the final straws for me. The Maliks also espoused and practiced the making of offerings on the Temple Mount until the Muslims discontinued it. I think they are the most recent group to make a serious run at this. A stupid question but wanted to ask just for clarification does celebrating it start from the Sat night ending at Sun night or does it start Sun night into Mon? Saturday night to Sunday night. If I missed it, I apologise. But what date do we celebrate Shavuot in 2014? Would there be any links to traditional ways on how to celebrate this feast? Thank you. Sunday June 8 (starting Saturday night at sunset). The karaites of Egypt used to eat a goose on this day, but no one exactly knows why. Thanks to you, I won’t feel like a goose now .. grin.